Senwes, one of the leading agricultural companies in South Africa, is centralising network management for its more than 140 sites nationwide with the implementation of a unified communications solution supporting both voice and data. The roll-out will be completed by Datacentrix, a provider of high performing and secure ICT solutions. The Senwes Group of companies is supported by three pillars: Input Supply, Financial and Technical Services, and Market Access, across the North West, Free State, Gauteng, Mpumalanga, KwaZulu-Natal, Eastern Cape, Northern Cape and Western Cape provinces. The group has an integrated business model to facilitate its core objective of making a meaningful contribution to food security in South Africa in a sustainable manner. 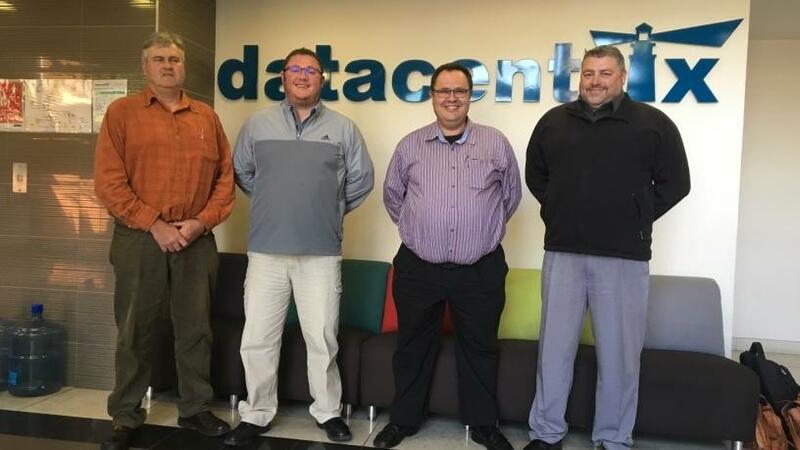 From left: Tertius Roux, WAN Manager at Senwes; Henry Minnaar, Technology Solutions account manager at Datacentrix; David Strauss, IT Project Manager at Senwes; Michael Storm, Cisco Sales Specialist at Datacentrix. A Datacentrix client for more than a decade, Senwes announced in October last year it wanted to replace end-of-life legacy PABXes, moving away from a reliance on analogue lines towards a new, fully fledged unified communications solution, with a view to improving reliability and freeing up internal IT support resources. Says Alf White, Senwes group executive for IT: "The main objective of this project is to move away from the organisation's use of analogue voice communications, which comprised a number of different PABX brands being supported by around 10 different vendors. We realised that our existing analogue equipment was reaching the end of its life expectancy, and that it needed to be replaced by a centralised, unified communications solution to mitigate the risks related to running outdated systems. "We also completed a travel analysis of Senwes staff, finding that the 2 500 staff members using the network were travelling a cumulative total of approximately four million kilometres per annum, excluding own fleet travel required. It was thus decided that a more collaborative solution would deliver greater productivity by allowing for video conferencing and document sharing features, as opposed to physical travel. "It would, in addition, alleviate the need for our IT support team, which provides central support via our Klerksdorp head office to all branch offices, to spend as much time on the road." According to Henry Minnaar, Technology Solutions account manager at Datacentrix, the agricultural organisation underwent a comprehensive tender process, which included a request for information (RFI) from 14 different companies, followed by a formal request for proposal (RFP) process involving a shortlist of four potential partners. "Datacentrix, a local Cisco Tier One Gold Certified partner, put forward the Cisco Meraki software-defined WAN (SD-WAN) solution, which, although not typically aimed at enterprise level, was an excellent fit for Senwes' specific needs. The biggest advantage of this type of disruptive technology is that, as a cloud-based solution, it provides centralised visibility and control of branch networks, managed entirely through a Web-based dashboard," he explains. "In addition, it can be rapidly deployed, is highly available, self-provisioning and self-optimising, and allows for automatic monitoring and alerts. "A lot of thought and work went into the design of the system for Senwes, as we wanted to make sure that we had the right fit for the environment." White explains that the SD-WAN based solution put forward by Datacentrix, as well as its national footprint and support levels, clinched the deal for the company. "Datacentrix really took it to the next level with its cloud-controlled network management suggestion, aimed at providing improved management of our networking and security infrastructure, and at a better price point too. "The innovative new network connectivity solution will not only deliver improved visibility of our entire network, it also gives us the ability to physically track objectives and benefits according to the business case," White concludes. The implementation of the unified communications project at Senwes kicked off in June this year.